I am looking at joining friends in Sa Tuna in early June. I will fly into Barcelona from Sydney and was wondering how I can get to Sa Tuna from Barcelona airport. I am a fit 65 year old lady and would consider a bus or train as long as there aren’t many transport changes. Sa Tuna is beautiful. I’m sure you’ll have a great time there with your friends, especially in June as it will be relatively quiet but the weather should be good. Take the Sarbus (operated by Sarfa) from Barcelona Airport, El Prat or Terminal 2 to Begur. The bus takes 3 hours 15 minutes and will cost €20.80. You can you buy the ticket online or at the Sarfa ticket desk in Barcelona airport. Depending on the time you have and what time of day you are landing, you may enjoy the bus from the point of view of seeing some of the towns on the Costa Brava. Begur is about 5km from Sa Tuna. As you are coming in early June, you will have to make your own way from Begur to Sa Tuna. The shuttle bus from Begur to all the local beaches operates from the last week in June to the second week in September. The nearest train station to Sa Tuna is Flaca (35km away). Take the train from Barcelona Airport to Barcelona city - either Barcelona Sants (takes 19 minutes) or Passeig de Gracia (takes 26 minutes). These run approximately every 30 minutes from 05.42 to 23.38. Then take the train from Barcelona Sants or Passeig de Gracia to Flaca (you have to click on the 'find all stations' button and manually find Flaca, as for some reason the website doesn't list it in the drop down menu. Then click on Barcelona as the destination. Once the timetable comes up, click on the ‘see routes on return’ button so you get the timetable going from Barcelona to Flaca). The train takes from 1 hour 31 minutes on the MD service and will cost €11.60 or 1 hour 48 minutes on the regional service and will cost €8.65. These run roughly every hour from approximately 07.00 to 22.00. There are usually taxis waiting at the train station in Flaca. The area around Sa Tuna is quite hilly, but as you say you are fit, so you may find it no problem at all. Sa Tuna is very small, other than the beach and a couple of restaurants there is nothing to do...bliss in many ways. 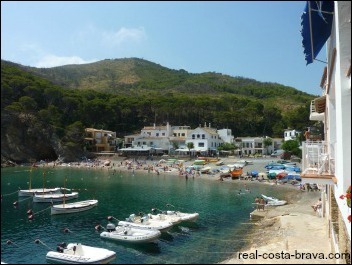 But you may find a bicycle useful for visiting the other stunning beaches on the Begur headland. If you like walking, make sure you do part of the Cami de Ronda walk around the Begur headland. It literally hugs the rocky shore and the views will take your breath away. From Sa Tuna you can walk in either direction to find stunning beaches along the Cami de Ronda.